Brett came good again yesterday with his ratings selection which we sent out as the free tip. Parys Mountain was a general 3/1 in the morning and opened up on course at 5/2 where the money came forcing the price into 7/4 favoritism. He won comfortably. Today I have another free selection from Brett. The ROI on these selections is really outstanding and the fact that it is all at Betfair SP makes these the perfect selections for anybidy who wants to win. Brett sends these selections direct to the mobile phone of members around 10:30 – 11.00 each morning. The profit since Brett started proofing these back in June is £1,355 to £10 stakes, which works out at over £270 per month profit betting just tenners. 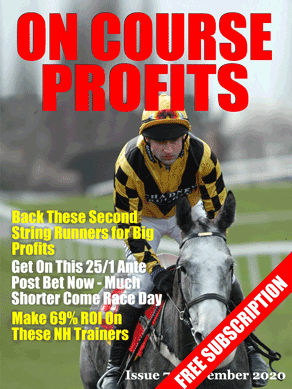 And because it’s Betfair SP everyone that bet them got the same profit. Happy days. If you missed out last time we offered this Brett has opened up his trial offer of £9.99 for new members. So you can try his regular service (31% ROI) and get his Ratings selections included for just £9.99 for your first month.